Born in Bayswater, London, in 1889, Frederick Kempster was of normal height just like his six siblings until he turned 15 and began to grow. His father had died of bronchitis when he was 8, and his mother Jane struggled to support the three youngest children, including Frederick, who were still living at home. She took in laundry and cleaned houses, but couldn’t make enough money to keep a roof over their heads. In 1898 they were evicted from their one-bedroom hovel in Islington. Homeless and destitute, the family was forced apart. Jane needed her children cared for so she could get a job as a domestic servant, so she sent her daughter to live with her sister and the two boys to Barnardo’s Commercial Street Shelter, a group home for orphans and indigent children, in London’s East End. A month before he turned 10 years old, Frederick found himself on a boat to Canada. Barnardo’s believed that the children in their care could carve out new lives for themselves in the wide open spaces of the frontier, so they regularly shipped hundreds of kids to Canada to work as farm hands and domestic servants. Frederick worked for a Manitoba farmer for the next five years until a weakness in his legs made him unfit for agricultural labor. 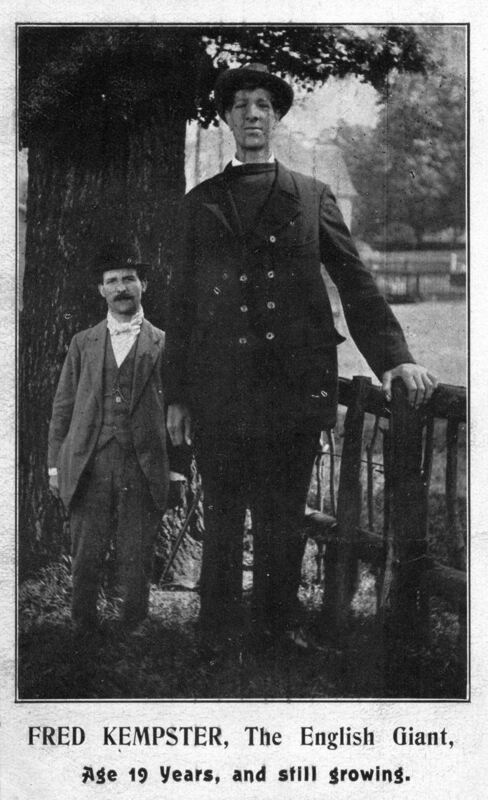 When he returned to England in 1904, his unusual growth had already begun. He went back to live at another Barnardo’s Home where he was taught the basket-making trade. By the time he was 19, he was well over seven feet tall (it’s hard to know precise figures because the reported figures are all over the place). 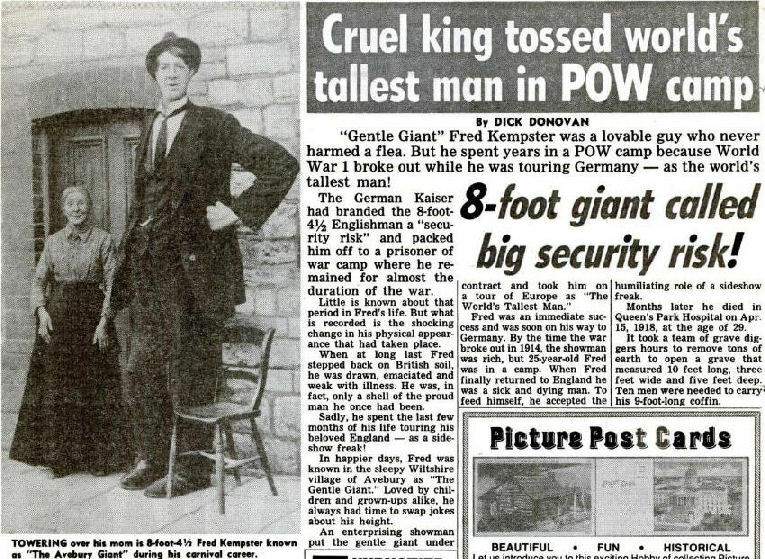 In 1911, he marched in the “Parade of Giants” at the Crystal Palace in London as part of the celebrations leading up to the coronation of King George V. That’s what gave him the idea that he might actually be able to make a living just by being his tall self. A few months later, he got a job as a giant at Astley & Co.’s American Circus in Essex. For the next three years he toured Europe and America with the circus, staying near his sister in Essex during his downtime. 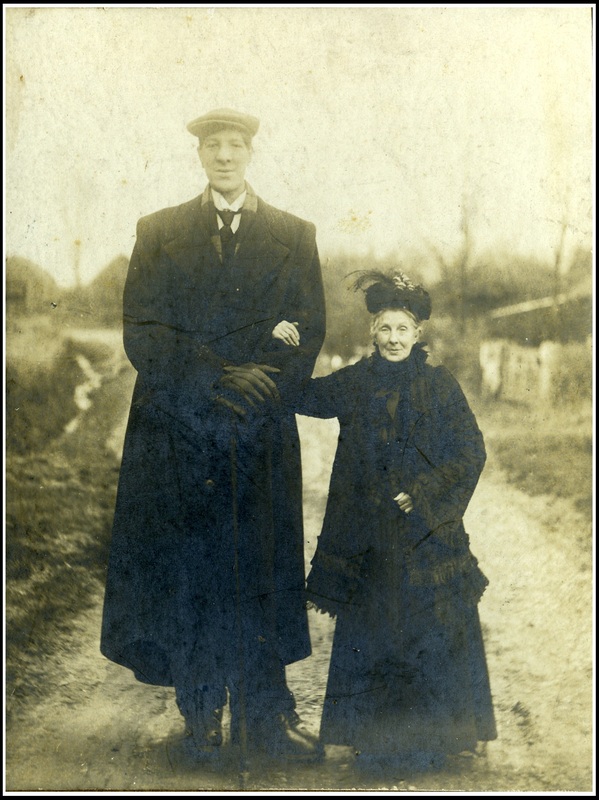 Articles about him from 1913 describe him as 7’9″ by now and over 300 pounds. Each hand reputedly had a 16-note reach on a piano. He was in Germany with his troupe when World War I broke out in August 1914. Frederick and four other members of the company including a legless dwarf were stranded in Berlin and kept under house arrest in a room they’d rented. Some news stories report that he was mistreated and malnourished, but in interviews Frederick seemed downright sanguine about his time as a POW. They played a lot of cards and dominoes, he said, and the local police chief would bring his kids around to see them. After a month, Germany let Frederick and company go. He stayed at an inn in Wiltshire run by another sister of his and her husband. He was never drafted to fight in the war. Depending on what story you read, the military either had no idea what to do with him and so left him alone, or they dearly wanted to put his freakish height to good use but just couldn’t figure out how. He was in no condition to be fighting anyway. He was lame in one leg and had been since a failed operation to repair his weak legs after his return from Canada. In 1917, he was hospitalized. He recovered enough to start one final tour in the north of England. While doing a gig in Blackburn, Frederick Kempster caught pneumonia and died on April 15, 1918. He was just 29 years old. Before he died, he met a doorman in Blackburn named Tom Cook whose wife Maggie was a laundress. They became friends and boon companions, and apparently, Maggie did his whites. Tom Cook’s nephew David Jardine found an enormous pair of long johns and a night shirt among his uncle’s belongings in the 1970s. After David’s wife Ivy died two years ago, their son John refound the extremely long johns while clearing out the house. It’s John putting the very long johns up for sale at Tennants Auctioneers in Leyburn, North Yorkshire. They will go on the auction block on April 28, with an estimated value of £150-250 ($238-$396).